In today's global internet-based marketplace, it's becoming increasingly difficult for online gaming and gambling venues to stay ahead of their competitors. This is especially true in the online casino and other online gaming activity world, where competition remains aggressive and the need to reach potential online customers and leads is strong. Best Games Directory can be one of your pipeline to successfully reaching visitors interested in online classic games, but also in online venues like casino, sports betting, lottery, bingo, scratch cards, blackjack, poker, roulette, slots. 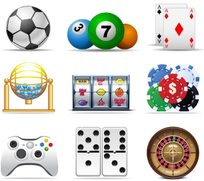 Through advertising on Best Games Directory, you will gain so needed exposure to worldwide visitors interested only in gambling and gaming products and services. At Best Games Directory, we do not only list quality web-sites. We also provide and add information pages that recommend and describe gambling and gaming products, for the convenience of our visitors. That's the way, our web-site is also visited by hundreds of end-users and players daily. We add fresh content frequently. Please see above, where ”Advertise Here” blue banner appear. This is our premium advertisement place, which appears and is visible at the top on every single page across our site. Maximum width: 788px. Maximum height: 90px. Cost: $500 per month flat fee. We are not interested in selling this place as performance based ad. Please see the picture at the left, where ”Advertise Here” blue vertical banner appear. This is our second premium advertisement place, and also appears and is visible on every single page across the site, at the left column. Cost: $400 per month flat fee. We are not interested in selling this place as performance based advertisement. If you prefer, we can remove the main site graphics (9 icons graphics at the top left) and your vertical banner could become placed higher, straight from the very beginning of the top left corner. This will cost yout: $100 extra per month flat fee. Please see the picture at the left, where ”Advertise Here” blue square banner appear. This is our premium advertisement place, and also appears and is visible on every single page across the site, at the left column. This advertisement is placed under the main top graphic (left top corner). This place is available, if 600px vertical banner (above) is not sold out. Cost: $300 per month flat fee. As you see on the left picture. ”Advertise Here” blue horizontal banner that is placed under the menu tabs, and is visible on the home-page. Cost: $250 per month flat fee. If you are not interested in the classic advertisement placement mentioned above, you could try our sponsorship program. If you have quality gambling, betting or gaming brand and want to be present on our site, you can choose our sponsorship program, to stay with our growing site. Every casino, gambling, sports betting or gaming brand need some exposure and presence, in order to attract targeted visitors and potential players. Please consider becoming sponsor of our site. Please read more details about: Become Sponsor of Best Games Directory program. Thank you. We could host guest article at our directory, as dedicated sub-page. One live link allowed to your site. Article should be no less than 500+ words, written in plain English, focused on topic, and not so commercially heavy (mean interesting to read for visitors). This price do not include link from home-page, pointing to your guest article. However, it include live link from regular position, from one relevant directory sub-category page. We encourage you to use our Featured and Regular Listing possibilities that could be placed at our directory top-category and sub-category pages. Please visit our special page: Featured Listings, for more details. Thank you. Interested in advertsing on our site? - please contact us. For ordering, more information, or to discuss your special or untypical requirements, please send us a message, by using the contact form below. Please read our conditions of acceptance of advertising that are available at the bottom of this page. Please just scroll down. Thank you. Any advertisement placed on our site must be legal, honest, fair and truthful, not defamatory and not infringe the copyright or any other rights of any third party. The advertiser agrees to compensate us, in respect of all costs, claims, damages, or other charges arising directly or indirectly as a result of the publication of your advertisement, on our Best Games Directory. We are going to refund you for any day, if our site is on error or not available to reach on the internet. We are not responsible for any errors or invisibility of your advertisement (if hosted on yours or third party server). We do not accept any liability in respect of any loss or damage as a result of failure of publication of your advertisement. Best Games Directory reserves the right to refuse the publication of any advertisement, at our sole discretion. If price terms have been agreed, pre-payment must be received in full, for at least one month in advance (or for one year, if there is one year term). The payment is non-refundable, unless we agreed to do so. We are not interested in selling place for performance-based advertisements. If you are looking for agreements that are counting impressions or counting the clicks, leads or similar situations, you should look for other web-site to advertise. We are sorry for this limitation. The acceptance of an advertisement does not mean that we are going to recommend any of your products or services, on our site (unless it is agreed). If you are looking for more explanation or more information not found above, please send us a message by using the contact form above. Thank you.